Windswept offers birthday parties on-site, as well as a wide variety of customizable programs for scouts, home schoolers, schools, businesses, and other organizations. 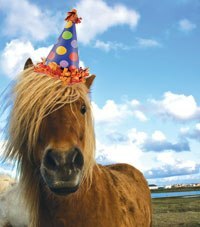 Birthday parties include a one-hour introduction to safety, basic care of horses, grooming and tacking, followed by riding sessions provided in groups of 2-4 riders. The use of a large, heated room with a refrigerator, tables, and chairs adjacent to the indoor riding arena is also included. Programs may include, but are not limited to, information about care of horses, a riding component, team-building activities using, and problem-solving exercises. Please contact the stables to request the date and time of your party. The receipt of a $50 deposit holds your date. Registration documents, release of liability forms, and safety information can be found on the forms page.